London has a rich and unrivalled sartorial history, and while its famous Savile Row remains the epicentre of the traditional tailoring culture, the flame of contemporary elegance burns brightest in a less celebrated corner of Mayfair. Working from a former art gallery near Oxford Street, Messrs Luke Sweeney and Thom Whiddett run Thom Sweeney, London's coolest bespoke tailors. This season the duo have produced their first ever ready-to-wear collection, which is exclusively available from MR PORTER. "We started the business in January 2007," remembers Mr Sweeney. "Before that we both worked for [the tailor] Timothy Everest in the East End." Mr Whiddett explains the duo's original intentions: "We wanted to have a bespoke tailoring house, looking after our clients with great service and great clothes." Key to their success is the fact that the suits are cut in a shape that's more relevant and contemporary than those produced by most bespoke tailors. "Our guys don't want to walk down the street in cropped trousers or with a jacket that stops half-way down their back," says Mr Whiddett. "But they still want to look modern and cool. 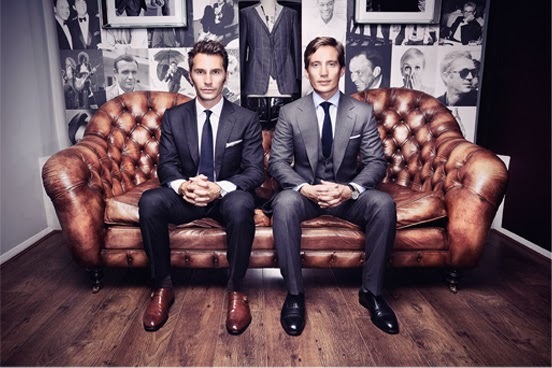 Our clients wear our suits at work, but also to [exclusive Mayfair clubs] 5 Hertford Street and The Arts Club. And because of the way they're cut you could also go to Shoreditch House [in London's fashionable East End], because it doesn't look like a boring city suit." All around Thom Sweeney's bespoke shop there are images of style icons from the past, men such as Messrs Frank Sinatra, Steve McQueen and Sir Sidney Poitier. However, the tailors use these old shots as a springboard that propels them forward, rather than a weight that holds them back. Mr Whiddett explains, "If an image still looks current then that says something about the guy in the shot, and the guy who made the clothes. But there isn't one old look that's just spot on, it's always about the proportions - the width of the trousers affects the size of the lapels. Our look is current without being edgy." It's a look that appeals to many high-profile Londoners, most notably Mr David Beckham who wore a Thom Sweeney suit when he piloted the Olympic flame down the River Thames en route to the opening ceremony of the 2012 Games. Among the things that sets Thom Sweeney apart from London's classic tailors is that the clothes the firm makes reflect modern life better than the traditional pinstripes-all-week-and-tweed-all-weekend dichotomy that still seems to inform much of Savile Row. Mr Sweeney explains, "We guide a lot of guys for what they're going to wear at the weekend and in the evening - people want to look better in the evening than they do in the office." 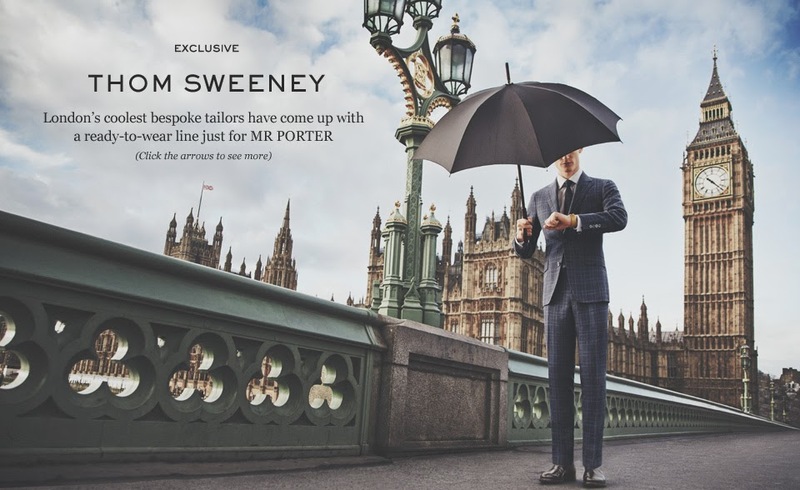 Thom Sweeney also caters for the growing number of men who like to wear separate jackets and trousers, even on formal occasions. "Separates are a big deal at the moment," says Mr Sweeney. "It can look great if you get it right, with a double-breasted blazer and trousers. One of our best customers is often in separates from nine-to-five, but come the evening he's in a mohair suit and a tie." Talking of mohair, which is made with yarn created from the hair of Angora goats, it's an important part of Thom Sweeney's superb dinner jacket. "The tux is really important to us," says Mr Sweeney. "We make a lot of tuxes for our clients. Whether you wear it once a year, or 10 times a year, it's something you need in your wardrobe. Every time we've made one for a bespoke client he's come back and said, 'I wish I'd done it earlier'. When you go to black tie events people notice." Mr Whiddett is equally evangelical, "If you've got a few good suits already and you come to an event where you want to dress up, there's nothing smarter." However, people also notice what a man wears at the weekend, which is why Thom Sweeney makes casual trousers and blazers. "We've done navy blue cotton chinos," explains Mr Whiddett, "with a slim leg, so you can dress them down with a polo shirt and sneakers. The main difference between the casual pieces and the formal jackets is that for the casual jackets we softened up the shoulders with a flat sleeve head, so they're a bit easier to wear." In fact soft shoulders are a Thom Sweeney signature, as well as a defining feature of most of what's good in contemporary tailoring. Mr Sweeney explains how the house block was developed, "The shoulder line's a bit softer than you get on Savile Row, but we still keep the roped sleeve head. It has presence, but it's soft to wear." These details have been taken directly from the handmade suits and put into the new collection. Mr Whiddett explains the rationale behind the ready-to-wear range, "It's in line with the bespoke, right down to the way it sits on the shoulder."